The Get.appversion.tk is just one of the many undesired web pages. It is made to fill the web browser’s constant stream of advertisements, or redirect the Firefox, Google Chrome, IE and MS Edge to not expected and intrusive advertising web pages. If your internet browser begin to reroute to the Get.appversion.tk web page then it’s a sign that ‘ad-supported’ software (also known as adware) was installed on your computer. The adware is made in order to display third-party ads to the user without asking his permission. The ad supported software takes control of web browsers and redirects them to undesired sites such as the Get.appversion.tk every time you browse the Web. The adware that responsible for the appearance of Get.appversion.tk redirect, is the part of the software that is used as an online promotional tool. It’s made with the sole purpose to open dozens of pop ups, and thus to promote the goods and services in an open web browser window. Moreover, the adware can substitute the legitimate advertising banners on misleading or even banners that can offer to visit harmful web-pages. The reason is simple, many advertisers agree on any ways to attract users to their web-pages, so the developers of adware, often forcing users to click on an advertising link. For each click on a link, the makers of the adware receive income. The malicious applications from the adware family that changes the settings of browsers usually affects only the FF, Google Chrome, IE and Edge. However, possible situations, when any other browsers will be affected too. The adware may alter the Target property of a browser’s shortcut, so every time you open the web-browser, instead of your homepage, you will see the unwanted Get.appversion.tk web-site. We suggest you to remove adware and clean your personal computer from Get.appversion.tk popup as soon as possible, until the presence of the adware has not led to even worse consequences. You need to follow the step-by-step guidance below that will help you to completely remove the reroute to Get.appversion.tk undesired page, using only the built-in Microsoft Windows features and several free malicious software removal tools of well-known antivirus software companies. In the instructions below we will have a look at the adware and how to remove Get.appversion.tk from Firefox, Chrome, Internet Explorer and Microsoft Edge browsers for Windows OS, natively or by using a few free removal utilities. Certain of the steps will require you to reboot your PC or exit this web-page. So, read this instructions carefully, then bookmark or print it for later reference. The useful removal guidance for the Get.appversion.tk pop-up. The detailed procedure can be followed by anyone as it really does take you step-by-step. If you follow this process to remove Get.appversion.tk pop-up let us know how you managed by sending us your comments please. 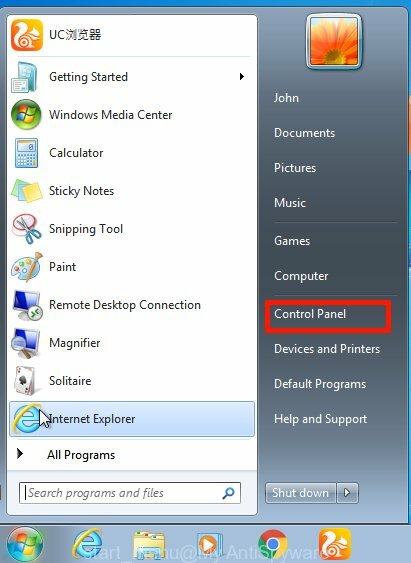 First method for manual adware removal is to go into the Windows “Control Panel”, then “Uninstall a program” console. Take a look at the list of applications on your system and see if there are any suspicious and unknown applications. If you see any, you need to uninstall them. Of course, before doing so, you can do an Internet search to find details on the program. If it is a potentially unwanted program, adware or malicious software, you will likely find information that says so. Carefully browse through the list of installed programs and remove all questionable and unknown programs. We recommend to click ‘Installed programs’ and even sorts all installed applications by date. After you’ve found anything dubious that may be the adware which causes unwanted Get.appversion.tk popup or other PUP (potentially unwanted program), then select this program and click ‘Uninstall’ in the upper part of the window. If the suspicious program blocked from removal, then run Revo Uninstaller Freeware to fully delete it from your personal computer. 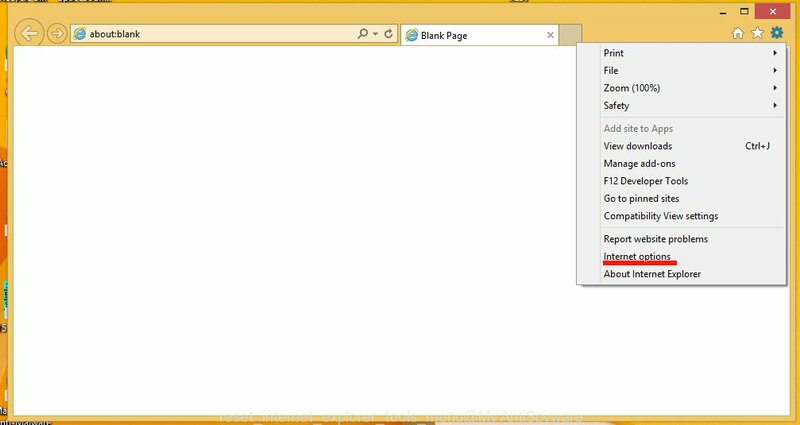 First, open the Internet Explorer, then click ‘gear’ icon . It will open the Tools drop-down menu on the right part of the web browser, then click the “Internet Options” as displayed on the screen below. After the process is complete, click “Close” button. Close the Microsoft Internet Explorer and restart your PC system for the changes to take effect. This step will help you to restore your web browser’s startpage, new tab page and default search engine to default state. 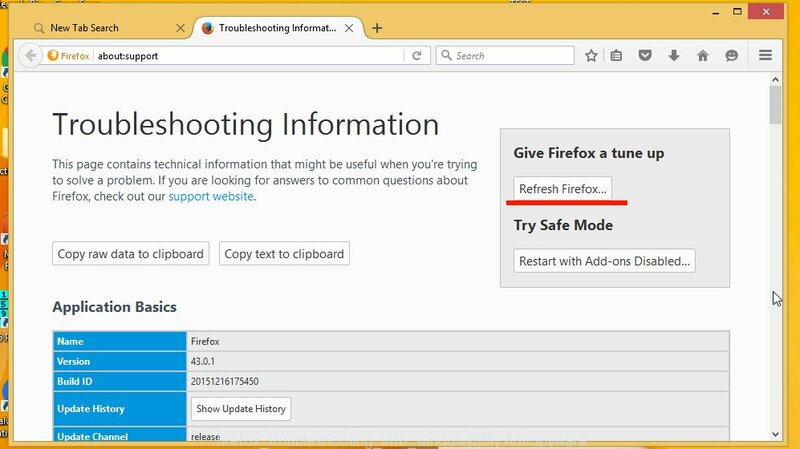 If the Firefox web-browser program is hijacked, then resetting its settings can help. The Reset feature is available on all modern version of Mozilla Firefox. 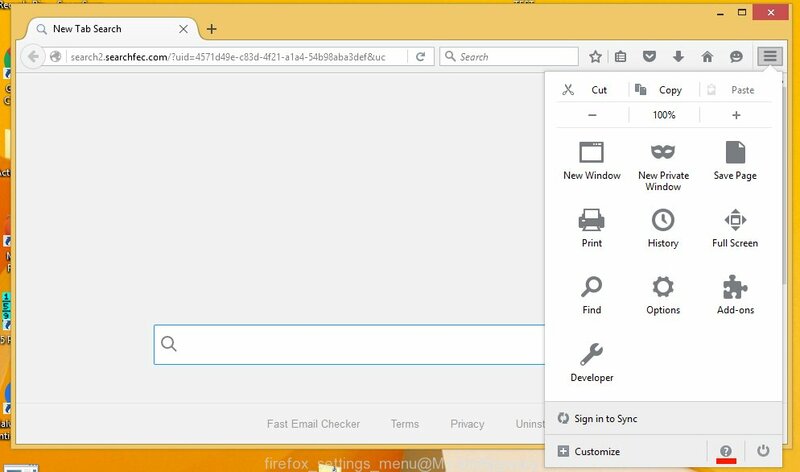 A reset can fix many issues by restoring Firefox settings such as homepage, newtab page and default search engine to its default state. It will save your personal information such as saved passwords, bookmarks, and open tabs. 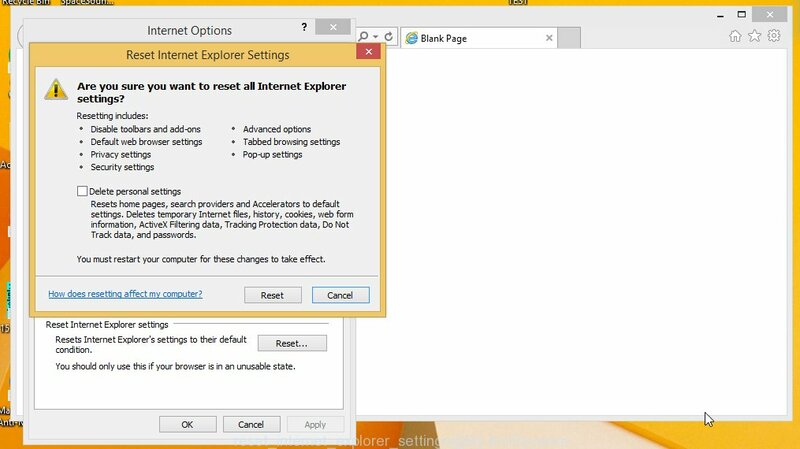 Reset Chrome settings is a simple way to remove the hijacker infections, harmful and ‘ad-supported’ extensions, as well as to recover the web browser’s newtab, homepage and search engine by default that have been replaced by ad-supported software which causes intrusive Get.appversion.tk pop-ups. Once this task is done, your web browser’s startpage, newtab page and search engine by default will be restored to their original defaults. 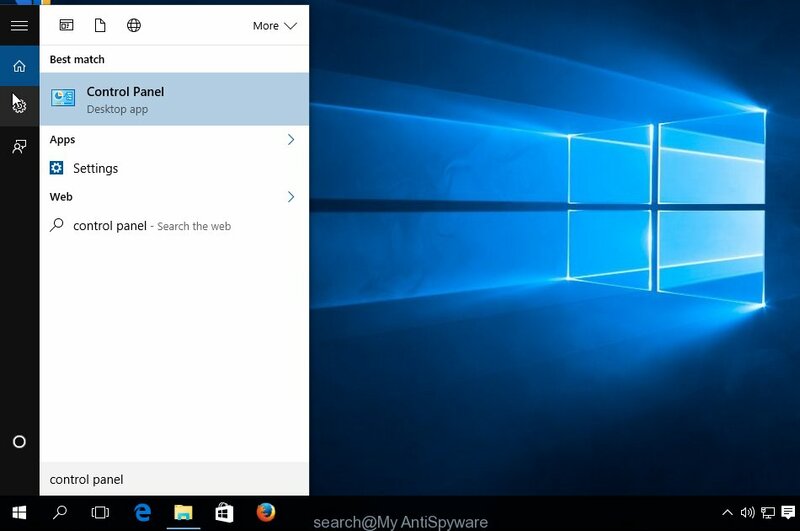 When installed, this adware that cause unwanted Get.appversion.tk pop ups to appear, may add an argument like “http://site.address” into the Target property of the desktop shortcut file for the Google Chrome, Internet Explorer, Firefox and MS Edge. Due to this, every time you run the internet browser, it’ll open an intrusive ad web page. Open the properties of the browser shortcut. Right click on the shortcut file of affected browser and choose the “Properties” option and it’ll display the properties of the shortcut. Next, select the “Shortcut” tab and have a look at the Target field as shown on the image below. In order to fix the hijacked shortcut file, you need to insert right path to the Target field or remove an address (if it has been added at the end). You can use the following information to fix your shortcuts which have been altered by ad supported software that causes web-browsers to display unwanted Get.appversion.tk pop up. Once is finished, click OK to save changes. Repeat the step for all internet browsers which are rerouted to the Get.appversion.tk undesired web page. If the unwanted Get.appversion.tk web-page opens automatically on Windows startup or at equal time intervals, then you need to check the Task Scheduler Library and remove all the tasks that have been created by ‘ad-supported’ application. Press Windows and R keys on the keyboard simultaneously. This displays a prompt that titled as Run. In the text field, type “taskschd.msc” (without the quotes) and click OK. Task Scheduler window opens. In the left-hand side, press “Task Scheduler Library”, as displayed below. In the middle part you will see a list of installed tasks. Please choose the first task, its properties will be show just below automatically. Next, click the Actions tab. Pay attention to that it launches on your machine. Found something like “explorer.exe http://site.address” or “chrome.exe http://site.address”, then remove this harmful task. If you are not sure that executes the task, check it through a search engine. If it is a component of the malicious apps, then this task also should be removed. Use malware removal utilities to remove Get.appversion.tk redirect automatically. The free software utilities specially designed for hijacker infections, ‘ad supported’ software and other potentially unwanted programs removal. These tools can get rid of most of adware from Chrome, Firefox, Microsoft Edge and Internet Explorer. Moreover, it can remove all components of adware from Windows registry and system drives. 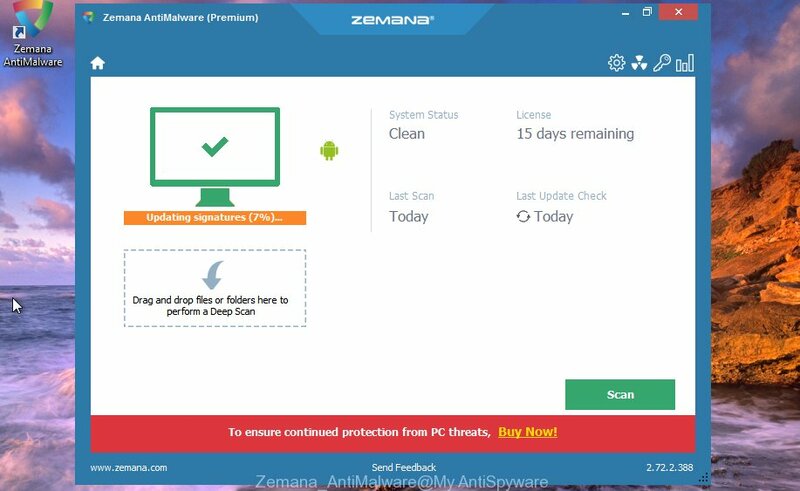 We suggest using the Zemana Anti-malware. You may download and install Zemana Anti-malware to search for and remove Get.appversion.tk redirect from the Chrome, Mozilla Firefox, Internet Explorer and MS Edge web browsers. When installed and updated, the malicious software remover will automatically scan and detect all threats exist on your system. Visit the page linked below to download the latest version of Zemana for Windows. Save it to your Desktop so that you can access the file easily. Once the downloading process is complete, close all windows on your machine. Further, run the setup file named Zemana.AntiMalware.Setup. If the “User Account Control” dialog box pops up as displayed on the screen below, click the “Yes” button. It will show the “Setup wizard” which will help you install Zemana on the PC system. Follow the prompts and do not make any changes to default settings. 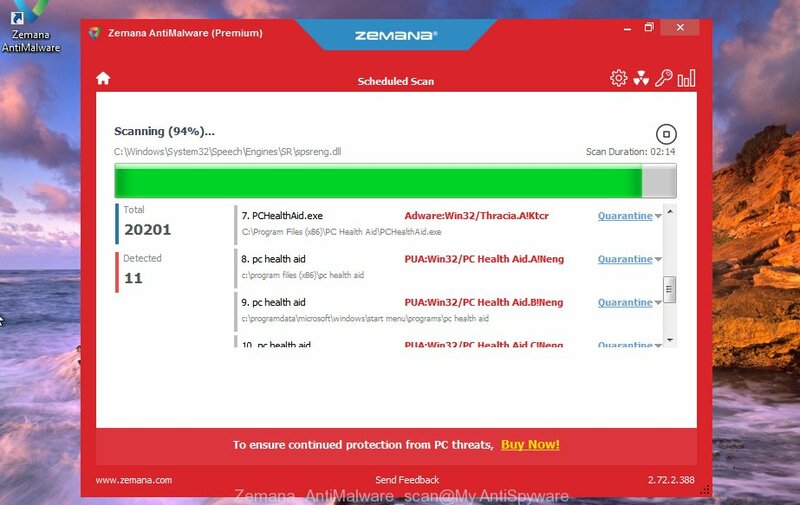 Once installation is complete successfully, Zemana AntiMalware (ZAM) will automatically start and you may see its main window as shown below. Next, click the “Scan” button . Zemana AntiMalware utility will start scanning the whole PC to find out adware that responsible for web-browser redirect to the annoying Get.appversion.tk site. This procedure can take some time, so please be patient. 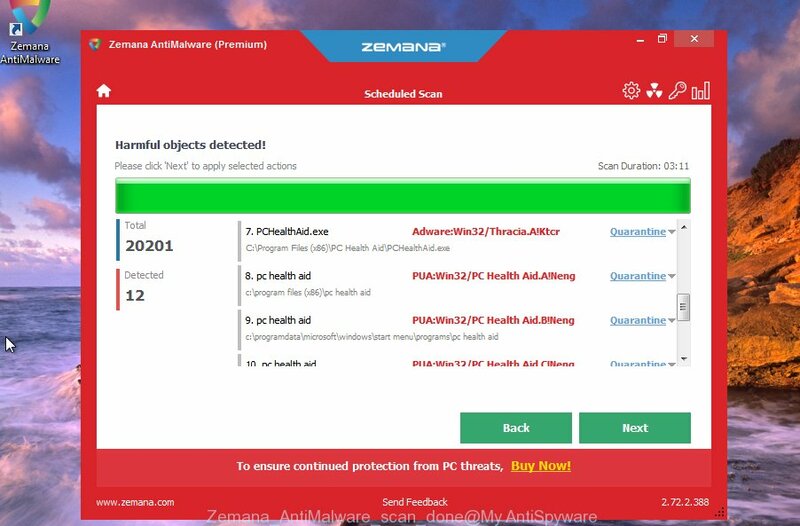 While the Zemana utility is checking, you can see count of objects it has identified as being affected by malicious software. When the system scan is complete, you can check all threats found on your PC. Review the results once the utility has done the system scan. If you think an entry should not be quarantined, then uncheck it. Otherwise, simply click “Next” button. The Zemana will remove adware that causes multiple unwanted pop up. After the process is done, you can be prompted to restart your computer. We recommend using the Malwarebytes Free. 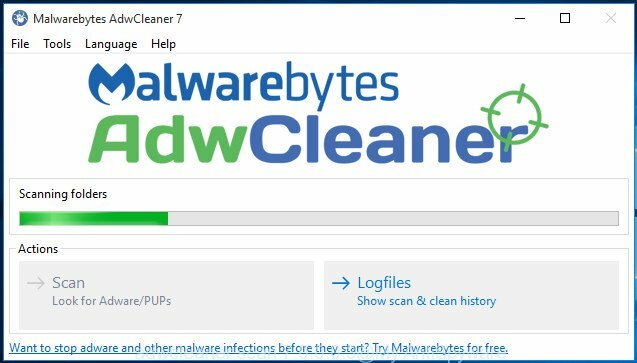 You can download and install Malwarebytes to detect adware and thereby delete Get.appversion.tk pop-ups from your web-browsers. When installed and updated, the free malicious software remover will automatically check and detect all threats exist on the computer. 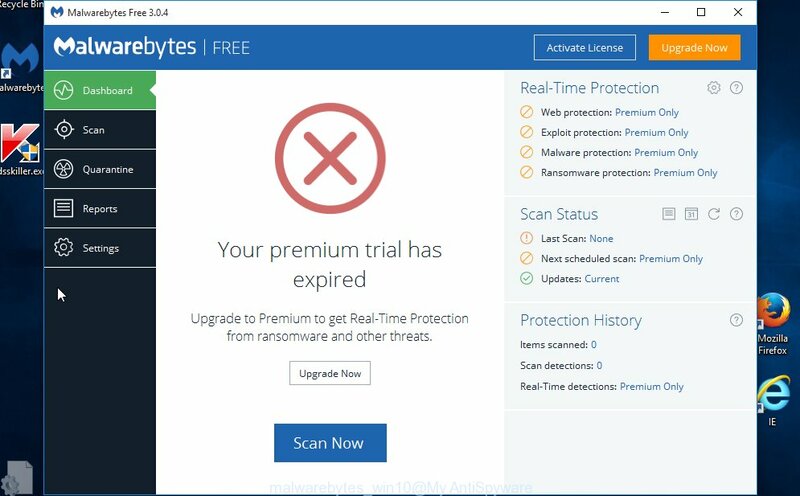 Please go to the following link to download the latest version of MalwareBytes Free for Microsoft Windows. Save it directly to your Microsoft Windows Desktop. When the download is done, close all applications and windows on your computer. Double-click the setup file called mb3-setup. If the “User Account Control” dialog box pops up as shown in the figure below, click the “Yes” button. Once installation is finished successfully, click Finish button. MalwareBytes AntiMalware (MBAM) will automatically start and you can see its main screen as displayed below. Now click the “Scan Now” button .MalwareBytes AntiMalware program will scan through the whole personal computer for the adware responsible for redirecting your web-browser to Get.appversion.tk page. A scan can take anywhere from 10 to 30 minutes, depending on the number of files on your personal computer and the speed of your computer. While the tool is checking, you can see how many objects and files has already scanned. 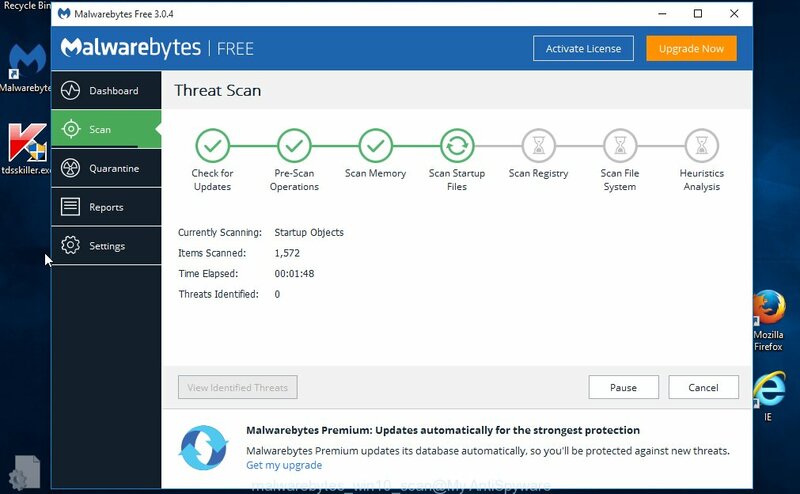 When MalwareBytes completes the scan, you will be displayed the list of all found items on your machine. Review the scan results and then click “Quarantine Selected” button. 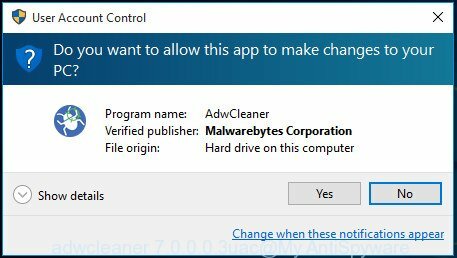 The MalwareBytes AntiMalware (MBAM) will delete ‘ad supported’ software responsible for Get.appversion.tk popup and move items to the program’s quarantine. After the cleaning process is complete, you may be prompted to reboot the computer. We advise you look at the following video, which completely explains the procedure of using the MalwareBytes to remove adware, hijacker and other malicious software. 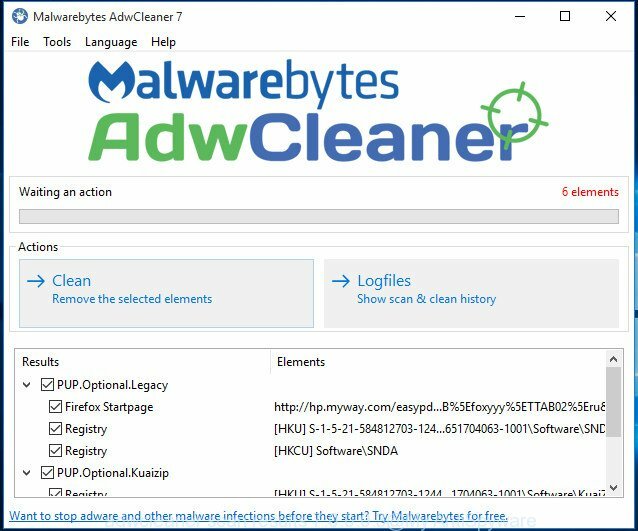 If MalwareBytes anti malware or Zemana cannot remove this adware, then we recommends to use the AdwCleaner. AdwCleaner is a free removal tool for browser hijackers, PUPs, toolbars and ‘ad supported’ software responsible for redirecting your web browser to Get.appversion.tk web-site. After the downloading process is done, open the file location and double-click the AdwCleaner icon. It will start the AdwCleaner utility and you will see a screen as displayed in the following example. If the User Account Control dialog box will ask you want to launch the program, press Yes button to continue. Next, click “Scan” to perform a system scan with this tool for the adware that responsible for browser redirect to the intrusive Get.appversion.tk web site. This task can take some time, so please be patient. During the scan AdwCleaner will scan for threats exist on your computer. As the scanning ends, AdwCleaner will display a scan report like below. When you are ready, click “Clean” button. It will open a dialog box. Click “OK” button. The AdwCleaner will remove ‘ad supported’ software which redirects your web browser to undesired Get.appversion.tk web site. After the procedure is finished, the utility may ask you to reboot your machine. After restart, the AdwCleaner will open the log file. Use an ad-blocking tool like AdGuard will protect you from harmful ads and content. 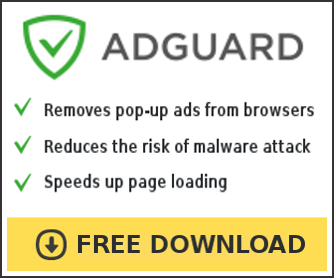 Moreover, you can find that the AdGuard have an option to protect your privacy and stop phishing and spam sites. Additionally, adblocker programs will help you to avoid undesired pop-ups and unverified links that also a good way to stay safe online. In most cases, the default settings are enough and you don’t need to change anything. 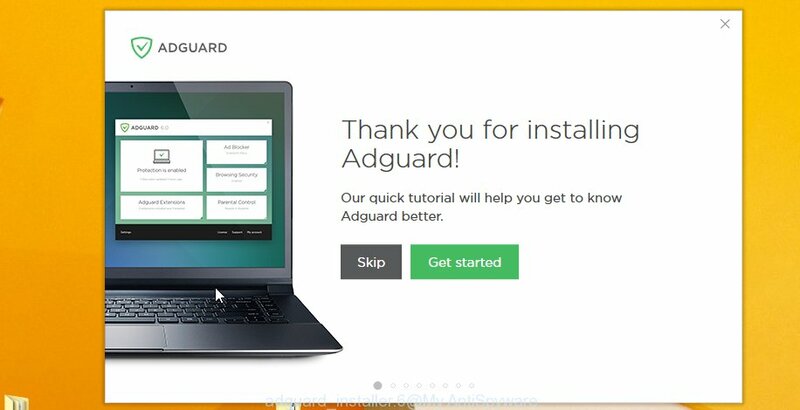 Each time, when you run your system, AdGuard will start automatically and block pop ups, sites such Get.appversion.tk, as well as other harmful or misleading sites. 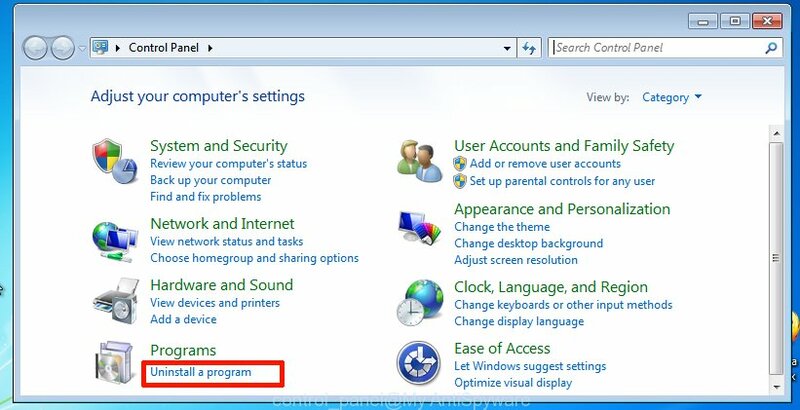 For an overview of all the features of the program, or to change its settings you can simply double-click on the AdGuard icon, that can be found on your desktop. 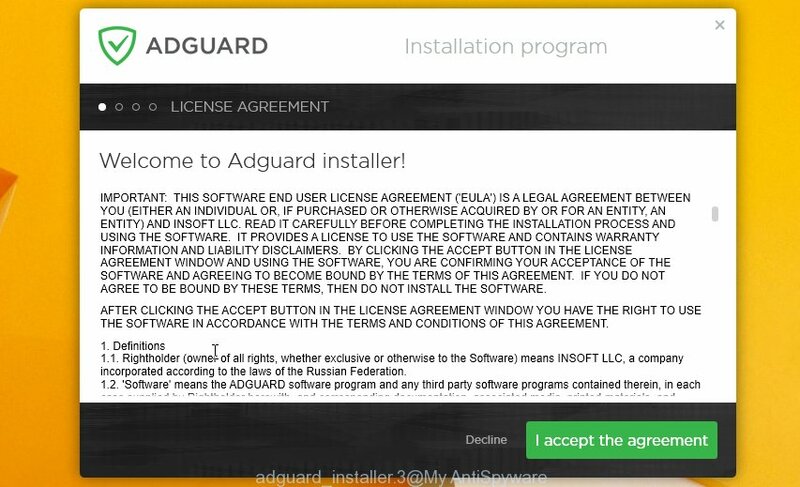 After completing the step-by-step instructions shown above, your personal computer should be clean from this ad-supported software and other malware. The Google Chrome, Firefox, IE and MS Edge will no longer open annoying Get.appversion.tk site when you surf the Internet. Unfortunately, if the few simple steps does not help you, then you have caught a new adware, and then the best way – ask for help. Please start a new thread by using the “New Topic” button in the Spyware Removal forum. When posting your HJT log, try to give us some details about your problems, so we can try to help you more accurately. Wait for one of our trained “Security Team” or Site Administrator to provide you with knowledgeable assistance tailored to your problem with the annoying Get.appversion.tk pop up.